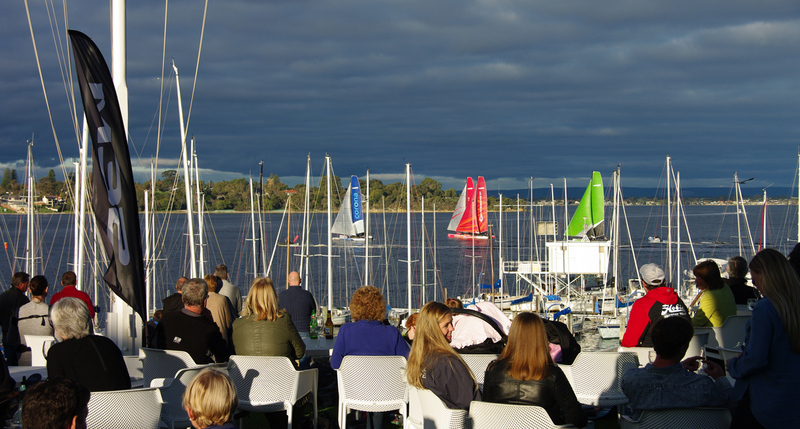 "The M32 Interclub Swan River Exhibition Race Series drew a huge crowd to Royal Freshwater Bay Yacht Club to watch the spectacular catamaran racing. Spectators enjoyed the magnificent view from the Club grounds and live video display on large screens around the venue. Perched high on Keane’s Point, Royal Freshwater Bay Yacht Club is ideally positioned to showcase the exhilarating M32 racing in the natural amphitheatre which is Freshwater Bay. Expert race commentators Ed Fethers and Ben Durham added a professional touch to the day. For those who could not get to the venue, the afternoon streamed live on YouTube. Watch the replay here. get the M32’s moving and teams worked hard to keep their momentum up. SoPYC, helmed by keelboat sailor Gerard Wilson, got off to a great start which was critical in the light winds. RPYC lost their speed and skipper Alistair Murchison took a while to get going again. 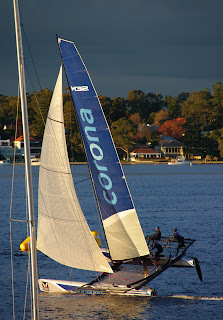 It was FSC, helmed by Laser sailor Ben Walkemeyer who managed to gain the lead and sail the best course to win race one. A very close finish for second and third with RFBYC, Lachy Gilmour, just sneaking in front with a little more boat speed to pass SoPYC at the line. He thanked the volunteers for an excellent day on the water and looks forward to the next round of the series at Royal Perth Yacht Club on 19 August. !